Approximately 600,000 people in the UK have a diagnosis of epilepsy. The prevalence rate of epilepsy in the UK is approximately 9.7 per 1,000 or 0.97%1. Although epilepsy is treatable with anti-epileptic drugs in the majority of cases, about 30% of patients suffer from drug-resistant epilepsy2. Patients with uncontrolled epilepsy heavily depend on informal care (family and friends) and on healthcare professionals. Complications due to intractable epilepsy result in frequent inpatient admissions and often involve transfers to intensive care units. Patients with drug-resistant epilepsy can potentially benefit from a ketogenic diet3. The ketogenic diet (KD) has been used for the management of epilepsy since the 1920s. It evolved from the observation that extended fasting led to significant seizure improvement. This effect can be replicated by altering the macronutrient intake in the diet, triggering a metabolic shift away from carbohydrate (glucose) to fat (ketones) as the predominant dietary energy source. The classical KD is a high fat, low carbohydrate, adequate protein diet that is based on inducing ketosis through providing a high ratio of ketone producing foods (predominantly fat). The rationale of a significant carbohydrate restriction is that, in response to lower glucose availability, changes in insulin and glucagon concentrations will direct the body towards fat oxidation and shift metabolism from ‘glucocentric’ (glucose) to ‘adipocentric’ (ketone bodies). The diet is calculated according to energy requirements and the sought after ketogenic ratio of fats to carbohydrate and protein, commonly 3:1 or 4:1. Other versions of the classical KD have been introduced in more recent years including the medium chain triglyceride (MCT) ketogenic diet (MCT KD) and the modified ketogenic diet (MKD). Despite these recommendations few patients in the UK are given the opportunity to access KD. Historically the ketogenic diet has been considered a restrictive diet that is hard to comply with and limits food choices of children who already have a difficult life. Recent advancements in the availability of computer meal planner programs, dedicated ketogenic chefs, and recipe developments have helped challenge this perception. Furthermore, charities such as Matthew’s Friends and Daisy Garland provide education, support material, recipes and helplines for families. New recipes and specialist products, such as KetoCal, provide families with choice, variety, palatability, independence and peace of mind. Although following a ketogenic diet has become easier and more palatable, it is still recognised that the diet requires a medical team, including a well-trained and experienced dietitian. Currently in the UK there are 23 specialist paediatric centres providing a ketogenic diet service for children. On average, 1.0 wte Dietitian maintains a case load of 29 patients with 18 new children started on the diet each year. Many of these centres, however, report that demand on their service is high, with waiting lists for patients wanting to commence a ketogenic diet often in place. The Nutricia team has recently developed a generic business case for establishing funding for extending or establishing new ketogenic services. The business case has been developed in collaboration with a clinical commissioner to provide a framework to apply for NHS funds. Trusts looking to set-up or extend pre-existing ketogenic services are invited to use the business case to help gain financial support. 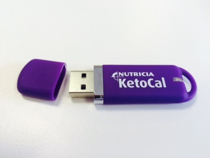 To request a copy of the business case uploaded on to a memory stick, please contact the Nutricia resource centre on: 01225 751098.